Developed to offer homeowners and tradespeople a safe and affordable solution to testing materials for asbestos. All of our kits come with simple, fully illustrated colour step-by-step instructions, HSE approved protective equipment and secure packaging to return your samples for testing at a government approved UKAS laboratory. Don’t take chances. Eliminate uncertainty by using the UK’s leading and original asbestos sampling kit from Azzikit. Fully supported by industry experts and includes all UKAS accredited sample analysis costs. Order by 5pm for same day dispatch. All samples are tested at a government approved UKAS accredited laboratory and your report is sent to you the next day by email. Safety is our business and always our priority. We have developed all the components of our kits to meet or exceed the recommended safety recommendations as set out by the Health and Safety Executive. We understand that most people need to test for asbestos quickly. That’s why if you order by 5pm Mon-Fri we promise to dispatch your kit the same day. Every sampling kit comes complete with clear, easy to use instructions, supporting diagrams and all the components you need to protect yourself and send your samples for testing. Our team are industry experts and on hand to help you every step of the way. We offer full support via our website FAQ’s, email, live chat and by telephone. Probably the single biggest benefit from using one of our sampling kits is the saving of labour costs associated with an asbestos surveyor. All the laboratory testing costs are included. Independently collected reviews by Feefo. Azzikit has been developed over many years. We are proud to be able to say that before Azzikit, there was no DIY asbestos testing solution available to general tradespeople or the domestic market. 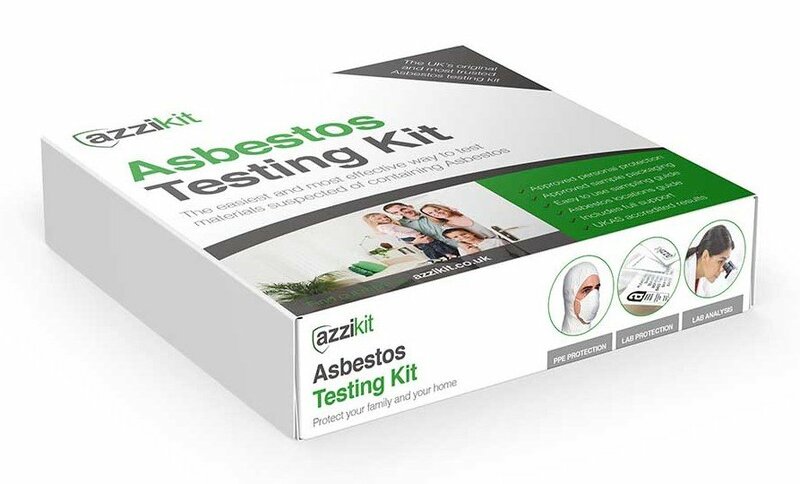 Azzikit has fast become a brand which is being recognised by homeowners and tradespeople as the go to product to use for safe and cost effective asbestos testing. Being dedicated to asbestos awareness and safety, we are trusted by some of the UK’s biggest companies. In recent years, we have expanded our products and services to the international market where again we have gained trust in the knowledge that we offer a safe, cost effective and reliable solution to testing for asbestos. How long does it take for my kit to be delivered? All orders completed on our website by 5.00pm Monday to Friday (excluding Bank holidays) will be dispatched the same day by 1st class Royal Mail. Azzikit comes complete with all the necessary Personal Protective equipment (PPE) such as full body coveralls, vented respiratory mask and gloves all of which meet the guidelines as set out by the Health and Safety Executive (HSE) for fibre protection. Along with clear and illustrated step by step instructions, the kit also includes all the necessary pre-labelled packaging for returning your samples safely for UKAS accredited laboratory testing. This meets the standards for compliance as set out in UK law. All laboratory testing analysis cost are also included. How should I package my samples? Azzikit comes complete with a full colour instruction booklet detailing each step and covers everything you need to know about packaging your samples with supporting images. Whats more, each kit comes complete with all the packaging needed to safely return your samples for testing. Don’t hesitate to get in touch with our industry experts. We are here and happy to help.